The Shogun 16ft-65KG Drywall Panel Lift makes home improvements, buildings and renovations easy. 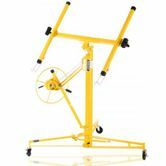 With a reach of 4.88 metres into the air and a maximum capacity of 65 kgs this panel hoist if perfect for a single person to operate and makes turns the toughest jobs in to simple tasks. This plasterboard lift is tough, durable and easy to use. 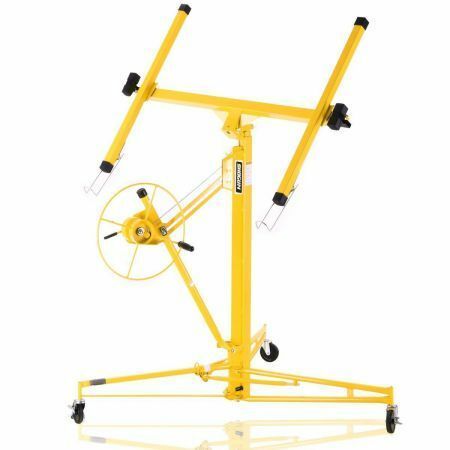 Featuring a stable a tripod wheel design and caster wheels for mobility, this lift allows you to install panels on ceilings whether at an angle or horizontally. This is the essential piece of equipment for your next DIY project. *Please NOTE: Max capacity of 65 kg.It comes with 11ft Drywall Panel Lift and one 6FT Extension Bar.When You Want to Get 16FT, You Need to Use One 6FT Extension Bar to Replace the 4FT in the Board of the 11FT Drywall Panel Lift. Maximum Height-16 Ft. /4.88m approx. Item is great shipping with Toll slow but I still got it nice tool.